I was introduced to plyometrics as an athlete. It started in high school and I did more of them during each successive stage of my career. Plyometrics is widespread in sports because it features a lot of jumping exercises and athletes do a lot of jumping in competition. The thinking goes like this: athletes jump in competition and should do similar jumping when training. There is a principle of training called “specificity,” which says that the body adapts to specific exercise in specific ways. Running a certain number of miles at one speed may increase the number of certain enzymes, for example, but running them at a slower speed may not. Therefore, the thinking goes, if you practice jumping in training you will jump higher or farther in competition. When used in its broadest sense plyometric exercise includes all types of jumps from the feet, pushes from the hands, the throwing of limbs in different directions, and throwing implements. Tudor Bompa, in his book Power Training for Sport (and who also wrote one of the world’s most influential books about periodization), classifies plyometric exercises by their intensity. He assigns five values of intensity with ‘5’ being the least intense and ‘1’ being the most intense. Intensity level ‘5’ exercises are low impact jumps and throws, often done in-place and often using implements. Jump rope and jumping jacks are examples. Intensity level ‘4’ exercises include 8-inch to 20-inch reactive jumps. Reactive jumpers start at a position above ground level, fall down to the ground, and immediately rebound to at least the same height that they started at. Examples include jumps from boxes. Intensity level ‘3’ exercises include bounding exercises. Bounds are single-leg or double-leg jumps repeated without stopping. One example is jumping repeatedly jumping from alternate legs for distance. Intensity level ‘2’ exercises include drop jumps. Drop jumpers fall from a height above ground level and freeze upon landing—they try not to budge even a fraction of an inch. These are also called depth jumps. 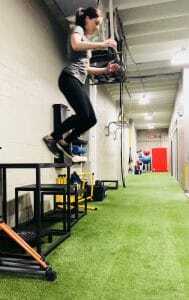 Intensity level ‘1’ exercises include 24-inch and higher reactive jumps. Hurdle hops are a very common example—we did countless numbers of them when preparing for the Atlanta Games. Plyometrics are ubiquitous in sports and athletes and coaches assume that they are effective. But researchers in exercise physiology have much to do in the way of proving that assumption. Meanwhile, contact us if you are interested in plyometric training. We can identify the best means to the ends that you have in mind—enhanced speed, power, etc.—even if the best means is something other than plyometrics.